DUKIZE, A. AND DAWE, J.L. Since excessive and uncontrolled lateral displacements can create severe structural damage in high-rise buildings, lateral drifts have been codified in various building codes. The present study investigates the inplane distortion of reinforced concrete (RC) frames infilled with unreinforced brick masonry panels subjected to inplane lateral loading. Tests were conducted on the-third scale RC infilled frames in order to examine the effect of the height to length ratio, H/L, and the beam to column moment of inertia ratio, I/I on inplane distortion of the composite system. 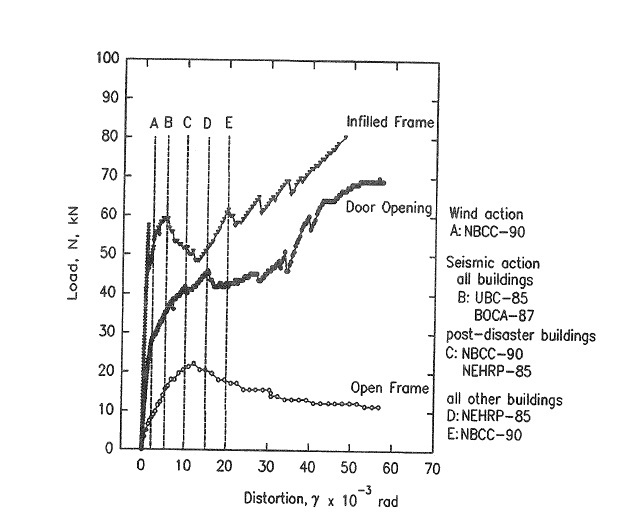 Ultimate distortions are compared to common values of interstorey drifts specified by various codes including UBC-85, BOCA-87 and NBCC-90. In addition to analyzing experimental results with respect to distortion at the occurrence of the first crack and ultimate strength, the study presents formulations which can be used to predict the load sustained by an open RC frame due to lateral loading.